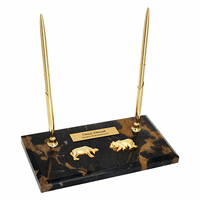 FEATURES/SPECS Help your favorite Wall Street broker or trader handle their correspondence in style with this marble and brass letter opener made just for them. The handle is made of black marble with detailed veins running throughout. It has a bull & bear emblem, the symbol of the financial industry, mounted front and center. The blade is made of polished brass and opens letters cleanly and easily.